Beetle, the company’s sole vessel, was constructed with two hydrofoils which completely lift the hull above the water surface while cruising. With this design, the vessel manages to avoid the choppy waves, resulting in a totally smooth sailing experience. This is also helped by the automatic level-stabilisers and sensors equipped throughout the Beetle; excellent news for those who suffer from sea-sickness. From the city of Fukuoka, the Beetle ferry embarks from Hakata, a ward of the city within Fukuoka Prefecture. As one of the oldest cities in the country, it was once a popular base for merchants trading with Korea and China during the middle ages, while it also recorded the fastest population growth in Japan in 2015 owing to the growing international tourism, particularly from the influx of cruise ships. Busan, the South Korean port city is much more than that; it’s dominated by a marvellous mountainous skyline, fringed by golden beaches, dotted with hot springs and famed for its superb seafood. With so much to enjoy once you step off the ferry, the country’s second largest city could well be your next favourite. As part of JR Kyushu Beetle Ferry’s new service, Tsushima Island can now be reached in just over one hour from Busan. With the shoreline of South Korea visible in the distance from the west coast on a clear day, the island is actually a beautiful subtropical strip consisting of two main islands named Kamijima, in the north, and Shimojima, to the south. Directferries.co.uk provides an impartial ferry comparison service allowing you to view numerous ferry company timetables and fares in one quick and easy search. 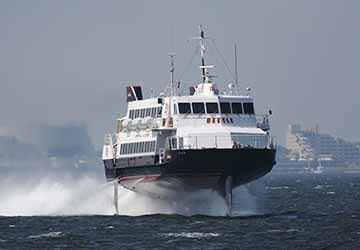 Compare JR Kyushu Beetle Jet Ferry timetables and prices now with all alternative ferry operators before booking your ferry ticket. Great staff made for a very pleasurable ride. Beetle ferry from Hakata to Busan was very convenient way to travel from Japan to South Korea. The staff on the boat was very friendly and helpful. I recommend to take the ferry instead of flying. I travelled with some friends from busan to Fukuoka with JR Kyushu Jet ferries and had a pleasant trip. The ferry was clean and spacious. Didn't feel like it was a long trip. Would definitely do it again.